A surprising tale reveals an unlikely friendship between two young women in the land of oz. Wicked tells the untold story of the wicked witch of the West and Glinda the good, long before Dorothy drops in. The remarkable Odyssey of their unexpected friendship leaves both their lives changed for good.Born with emerald-green skin, alphabet is smart, fiery and misunderstood. 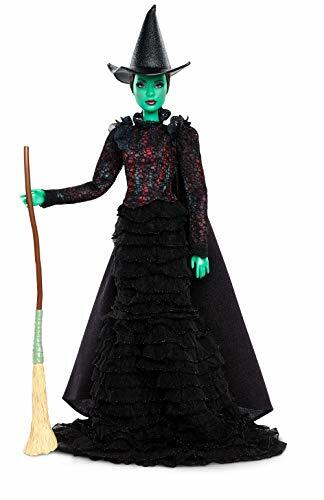 The wicked elphaba Barbie doll wears her signature act II costume -- a black dress, black ankle boots, dramatic black cape, black pointed hat, and has a broom accessory, of course. Her hair is styled in a long, braided ponytail. This doll captures all the excitement of wicked and is a keepsake fans will love! includes fully posable wicked elphaba Barbie doll, cape, hat, broom, doll stand for display and Certificate of authenticity. 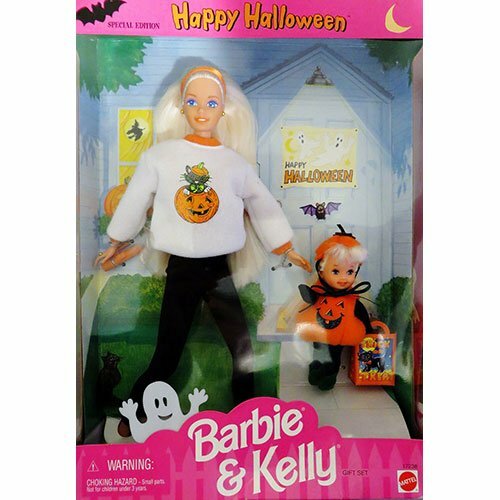 Barbie wears black fitted slacks and a loose white sweatshirt with orange trim and a decal on the front with a cat coming out of a pumpkin. She has thigh length blonde hair and carries a flashlight. Kelly is dressed as a pumpkin with green elf-like shoes and carries a paper trick or treat bag with a cat pictured. Kelly has long light blonde hair like Barbie. The box background is a Halloween house scene. 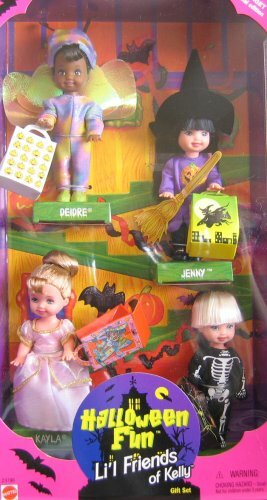 Includes brush and flat shoes for Barbie.